All visits to the Alderley Edge mines have to be arranged with a DCC member. To find out more, follow the links from this page. "Tuesday Night" and other bookable mine trips are held regularly. They are suitable for individuals or groups, large or small. Go to this page to see a list of available dates and to make a booking. Some Tuesday Night mine trips are run on behalf of Cheshire East Ranger Service. Open Days are a good opportunity to visit the mines and find out more. Read about details of future Open Days and how to book trips. Specialised trips for geologists are now available, go to the geological visits page for details. If you have a particular interest, we can take you on a specialised guided trips. For more information, read our page for specialised groups. For visits by Scouts (including Beavers and Cubs), please refer to the special page for Scout organisers. For filming, please go to this page. If you are experienced in visiting caves and mines, you may still want to read the general guidance or jump straight to the details of trips for more experienced visitors. 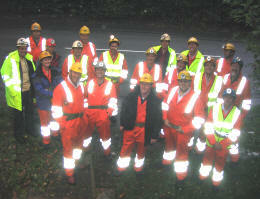 For more about caving or visiting mines elsewhere with the DCC, other than at Alderley Edge, visit our caving web pages. For information about parking, refreshments, etc., have a look at our page about the facilities on the site. On another page on this website, you can find the safety guidelines that should be read before your trip. Leaflets are also available in a variety of European languages on our Euroleaflets page.